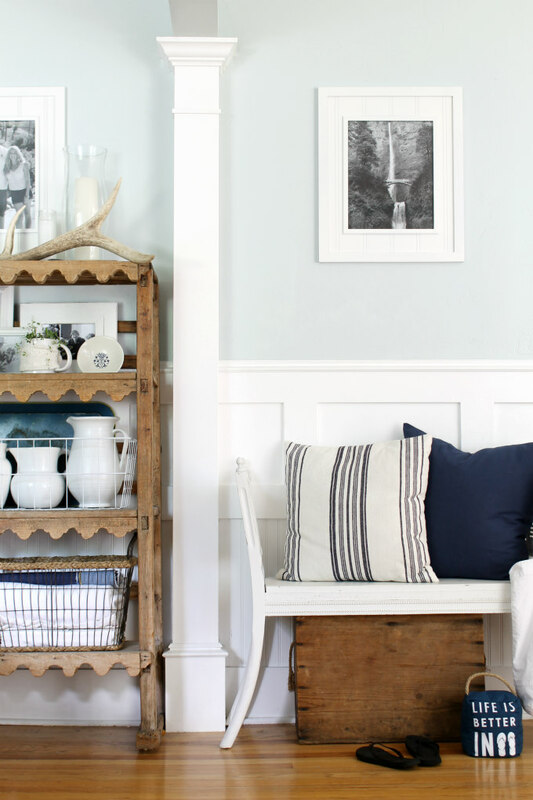 Today I'm joining an amazing group of bloggers to take part in the Blogger Stylin' Home Tours Summer edition, hosted by The White Buffalo Styling Co. 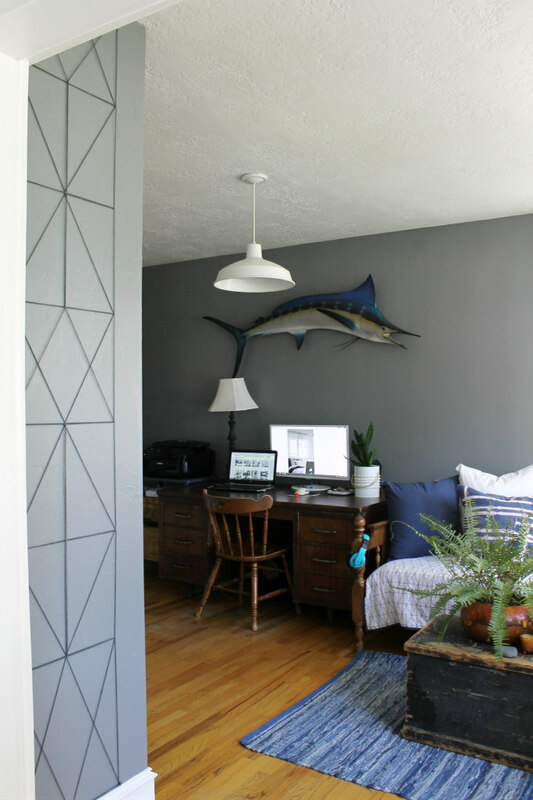 This is such an awesome group of bloggers and I hope that you will take the time to check out all of their unique and stylish homes. Today is the last day of the tour. You can start the tour Here or if you are already following along, then you have probably come from With Heart. 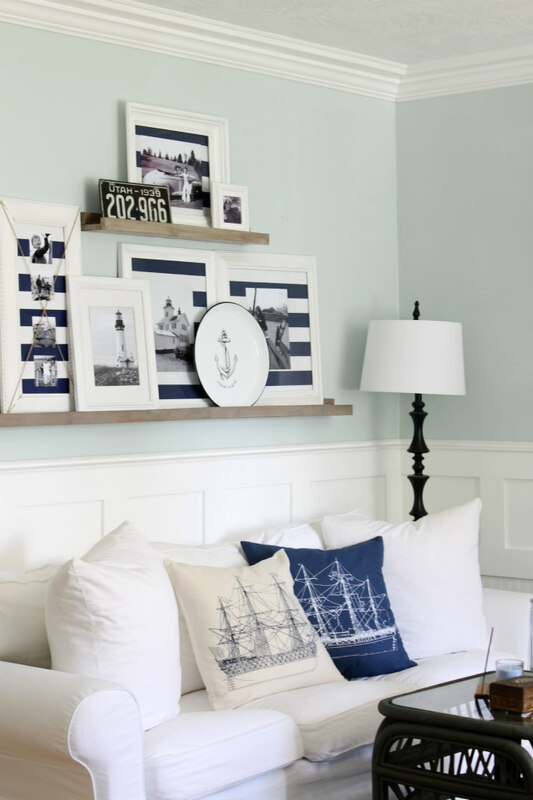 What a beautiful bedroom reveal, Jennifer is always so inspiring. Welcome to our 1924 cottage! I like to refer to our home as a beach house because to me it looks like it belongs near the beach. 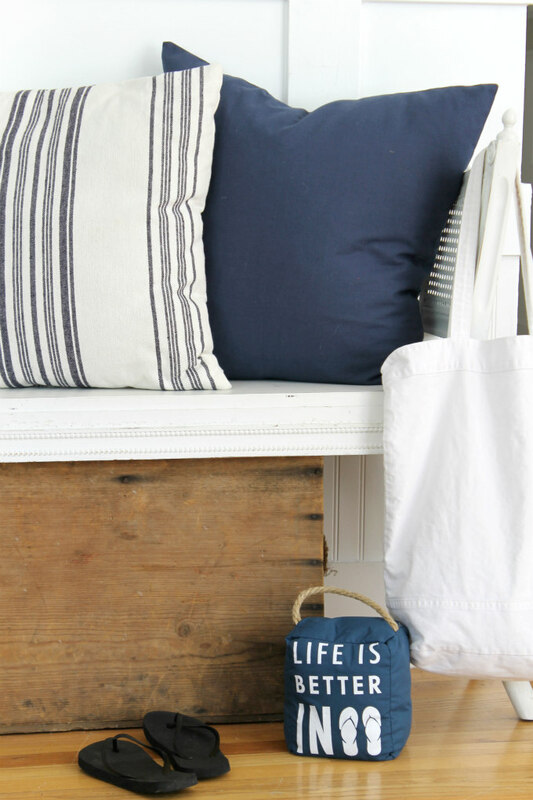 I decorate our home with a casual coastal look that is relaxed and easy going. However, we live in the country nowhere near the beach, but it's fun to pretend :) Your home is what you make it, right? I recently made this sign that is hanging in our entryway and blogged about it HERE. It's the lyrics from one of my favorite songs which are a great reminder to not stress out over the little things. 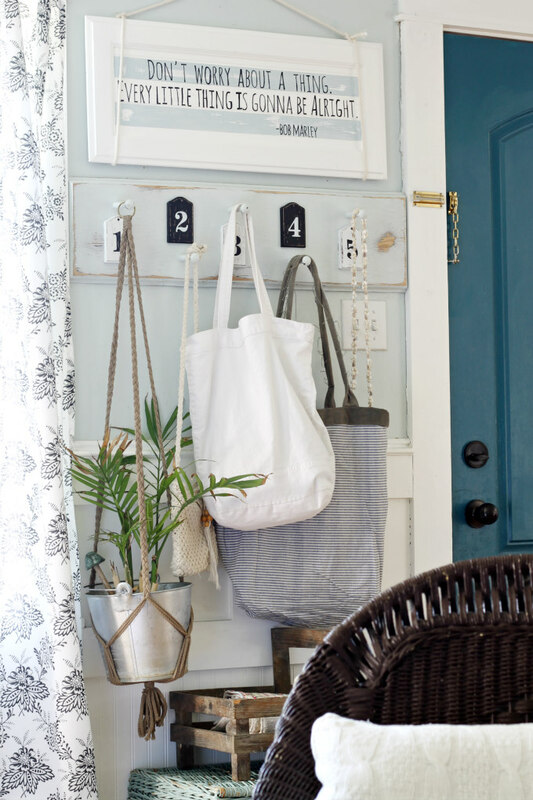 I then layered this coat rack with lightweight totes that are easy to grab for on the go. 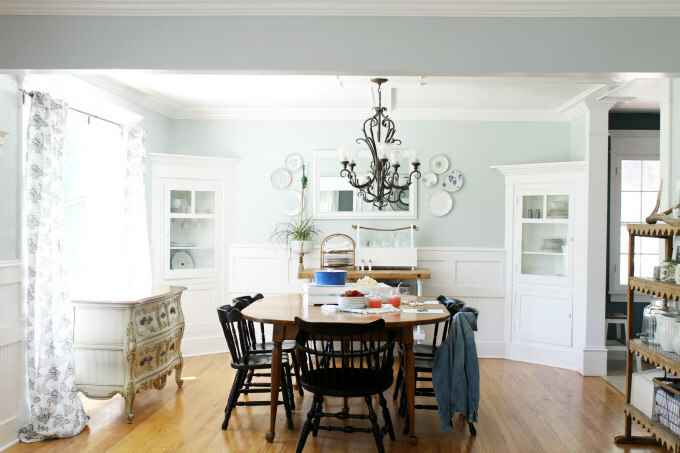 When you walk into our home you are greeted in our big open living and dining room. 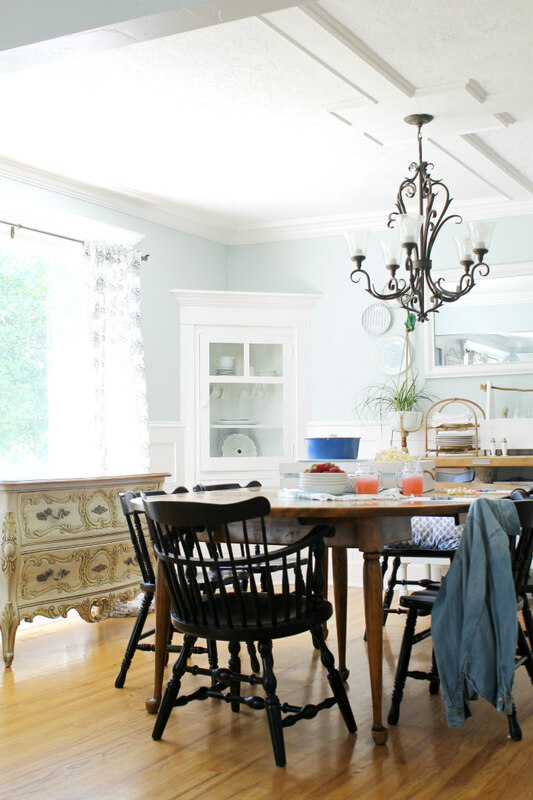 I'm going to share the Living room side in part 2 of this Summer tour on June 22nd, so be sure you are following me so that you don't miss seeing the rest of our Summer home tour. You can follow me by e-mail, Facebook and/or Instagram. With my two boys home all day for summer vacation, the dining room table is where we will be working on a little light summer school. 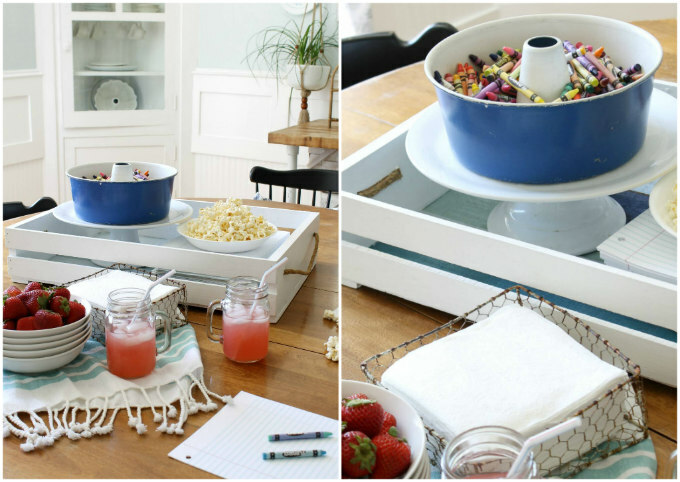 To make it fun, I filled a bundt pan up with crayons, added a stack of paper for writing and drawing along with some healthy snacks. This wall here is the first thing you see when entering our home, so I always try to keep it fresh and welcoming. 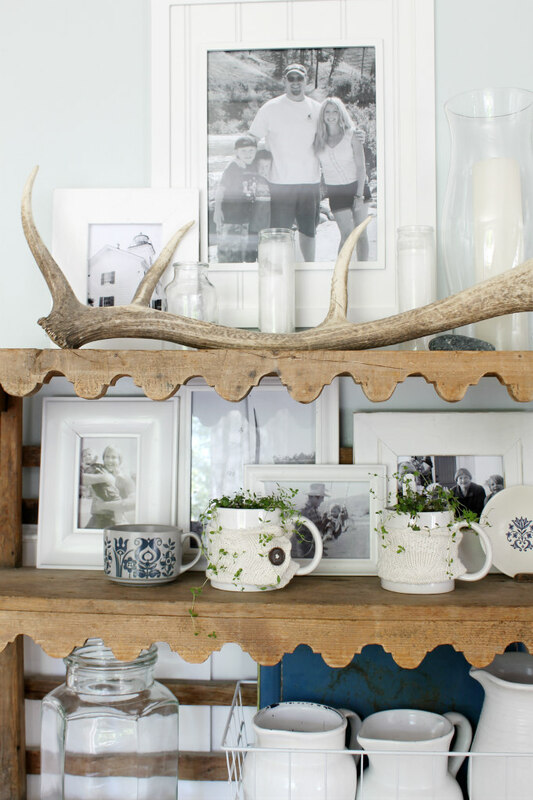 I am constantly switching up the decor on this antique shelf, but most likely you will always find white dishes, white picture frames, and a few small plants because those are my go-to styling items. How cute is this Life is Better in Flip flops door stopper?! It's from Pavilion Gift and I just adore it. You can find it here along with many others including some that would be perfect for Father's day gifts. Here is just a little sneak peak of the living room. I can't wait to share more of it with you, so remember to come back for the second half of this tour . 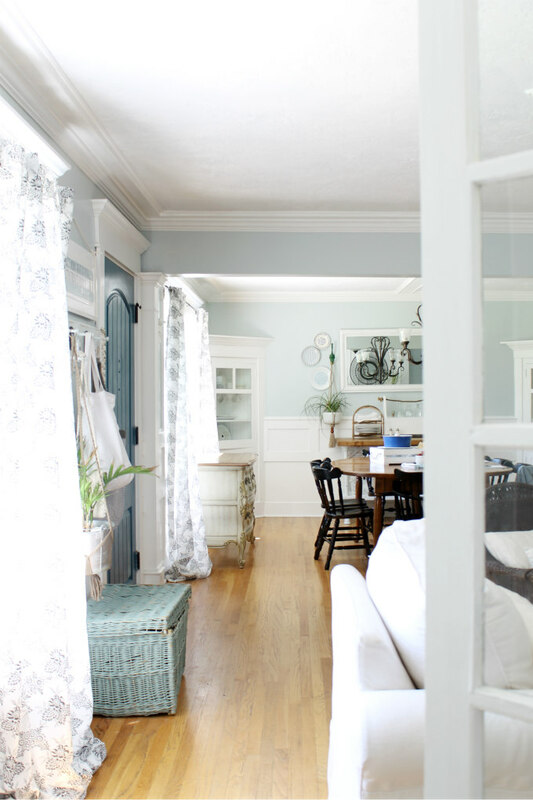 Off of the living room are some french doors that lead you into our home office. I know I share this room a lot but it's because it's my favorite room in the house. Even though I share this room a lot, there are a few new things in here that I want to share. 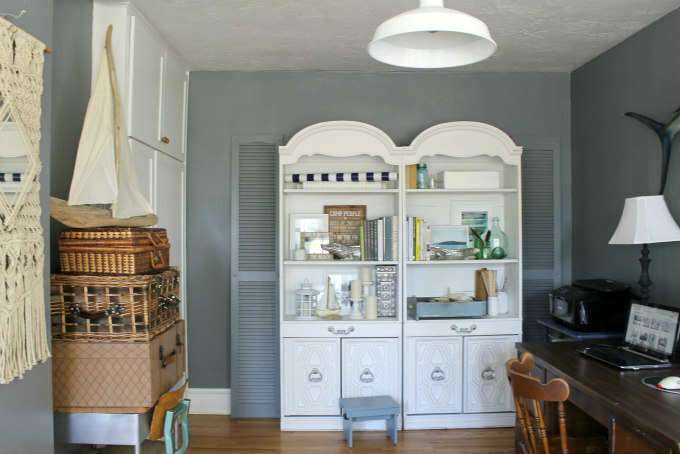 I switched out the rug for this denim one I got at Big Lots years ago. All of the air plants that I had sitting on the antique trunk got moved to another location, and in there place I added a big fern plant, as well as this cute Buddha water fountain from HomeGoods. Unfortunately the fountain doesn't work, but I still like it nonetheless. 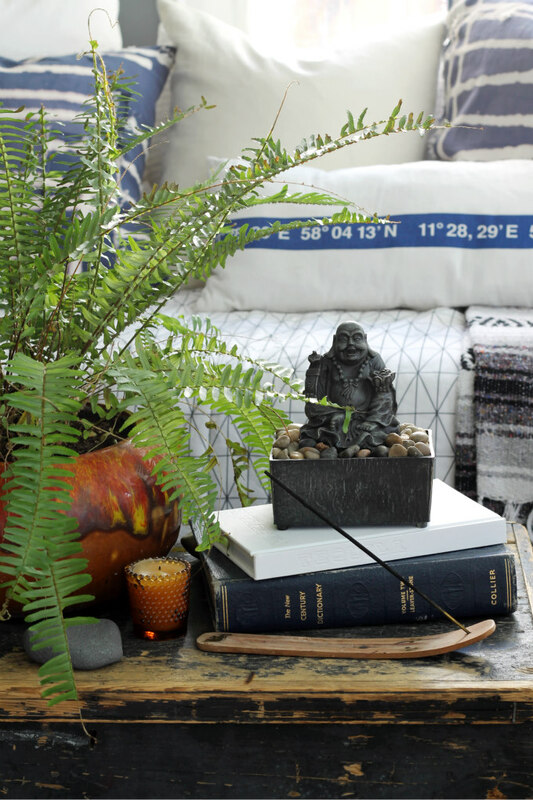 You can always find incense burning in our home. I just really love the earthy smell of them, plus they seem to provide a relaxing vibe which is what our home is all about. Sometimes I refer to this room as the sunroom because of all of the windows. Aren't they wonderful? 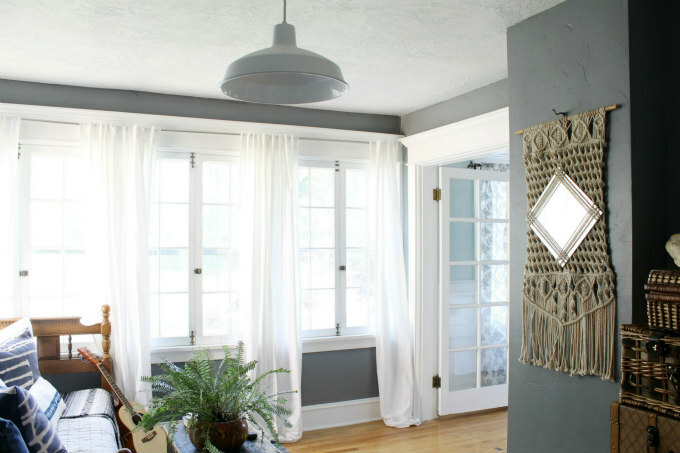 Right now my most popular post are these curtains I made from five dollar Walmart sheets. 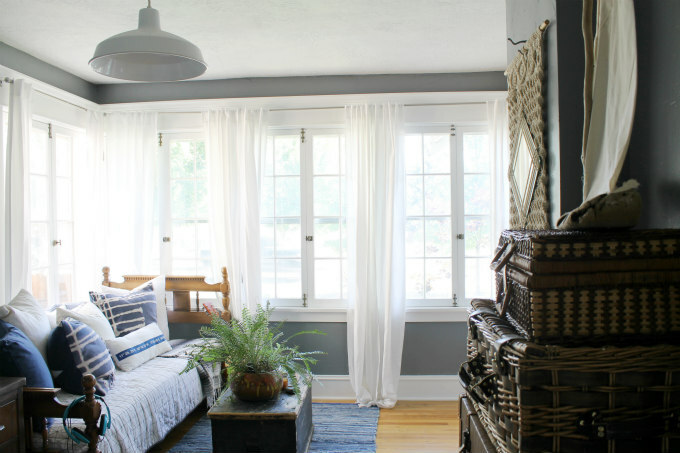 They are perfect for this room because they provide us with the privacy we need but without covering up all of the beautiful old windows. 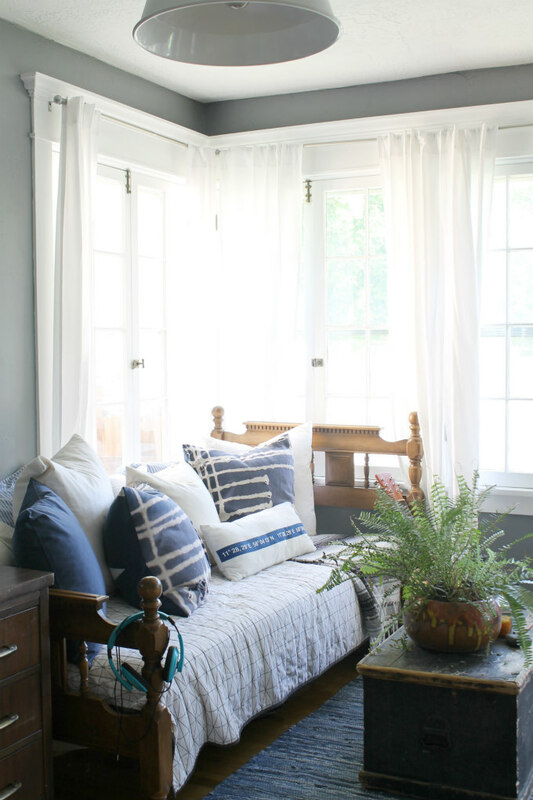 This daybed was actually my husbands bed when he was a kid, which I think is cute. It makes for a great spot to come in and relax. So if you follow me on Instagram, then you know that I recently picked up this fabulous macrame mirror at a yard sale for five dollars. Seriously!! It might just be my best score ever! It's perfect for this wall here, right next to my DIY string art on the wall. 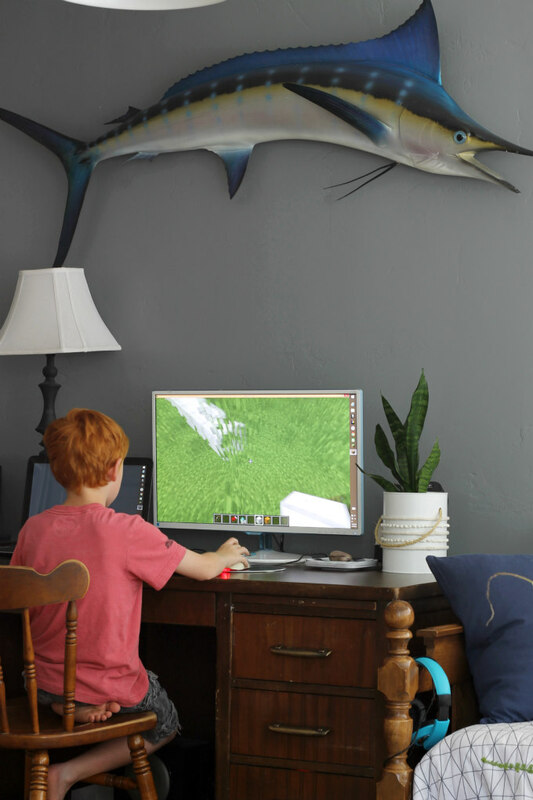 I once wanted to paint this marlin that sits about our desk, white. 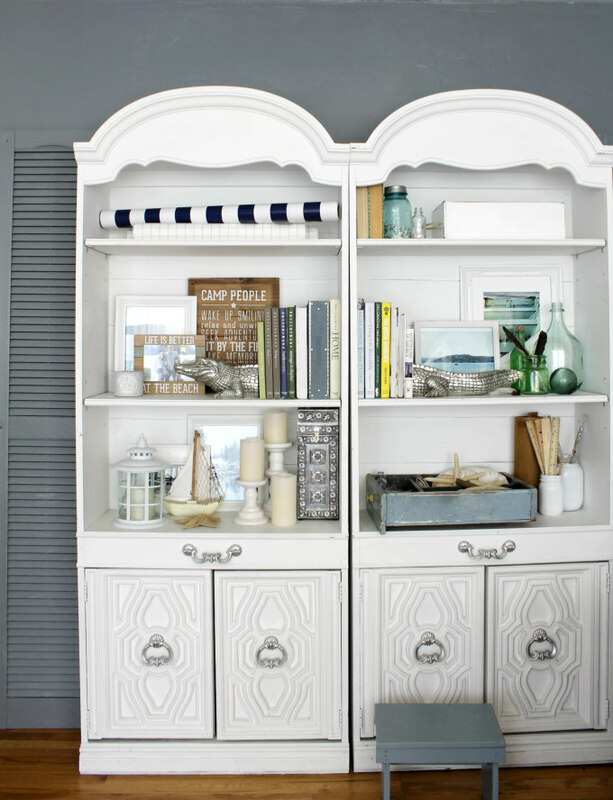 I love white paint, but I'm glad my husband wouldn't let me do it. It really ties the whole room together. On the other side of the room are a pair of old bookshelves. I am constantly switching things around on these as well. I was going for a beach collected look, so you will see lots of little treasures like shells, feathers and bottles. And again, some white picture frames, which I just added some of my own photography to, Most of the pictures I just took on are recent trip to Coeu D' alene lake. My favorite thing on the shelves are these 'We People' items that are also from Pavilion Gift. 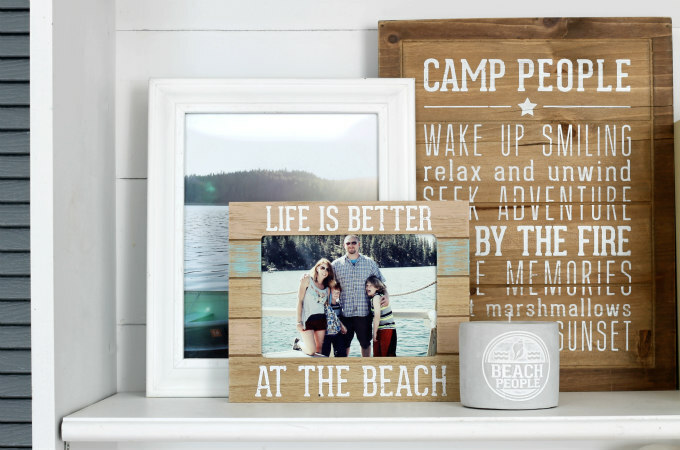 I've had the Camp People sign for awhile now, but the 'life is better at the beach' frame is new. I placed a fun little picture of my family in it. 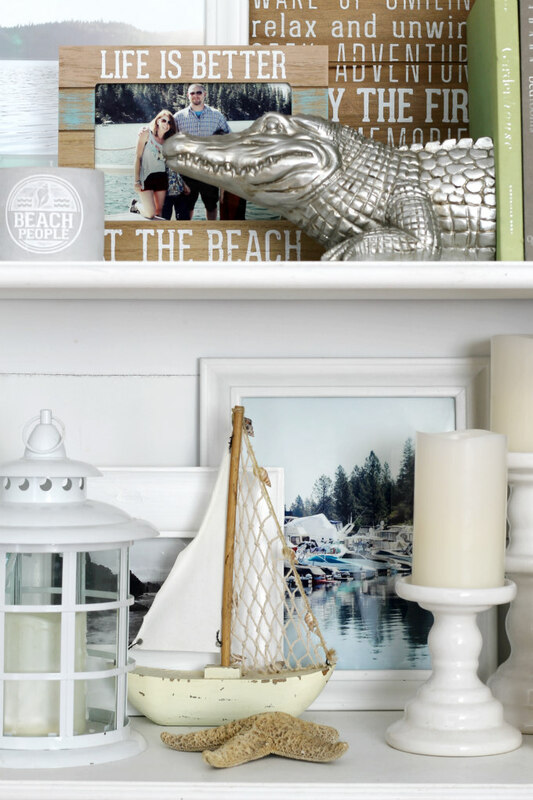 This Beach People candle is my favorite because we are definitely beach people! (as well as camp people) The We People line also comes in; lake people, fish people, farm people, and so many others. I just think they're all so cute. 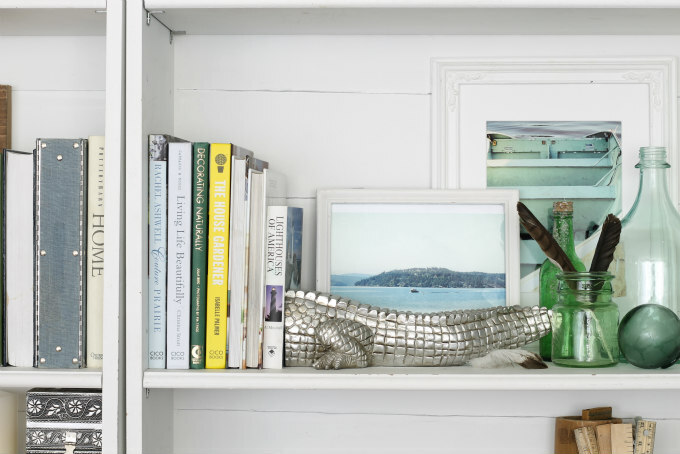 The alligator bookends are funny right? They were a gift to my husband from his uncle. Okay, well that is probably enough pictures for one day. But be sure to come back over for part 2 if you would like to see more. Next up on the Tour is My Fabuless life. 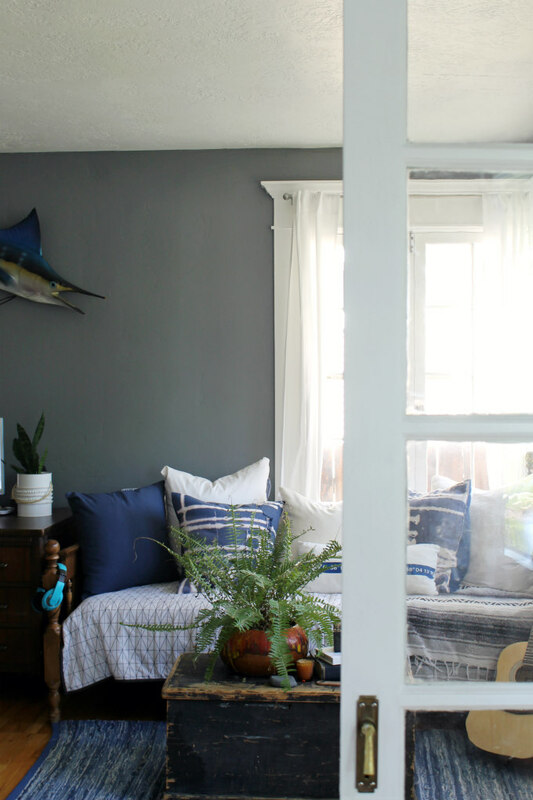 I absolutely love Jenn's style and I can't wait to see how she has decorated her home for Summer, So lets head over together. 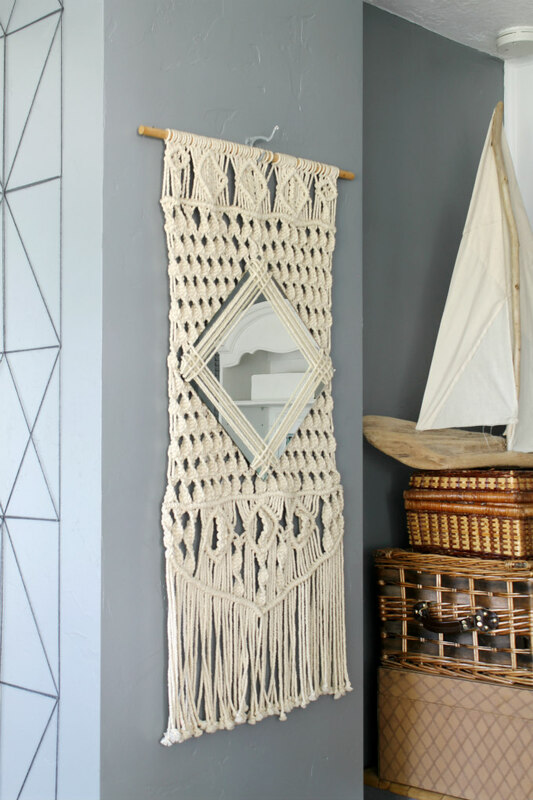 that macrame mirror is so incredible! 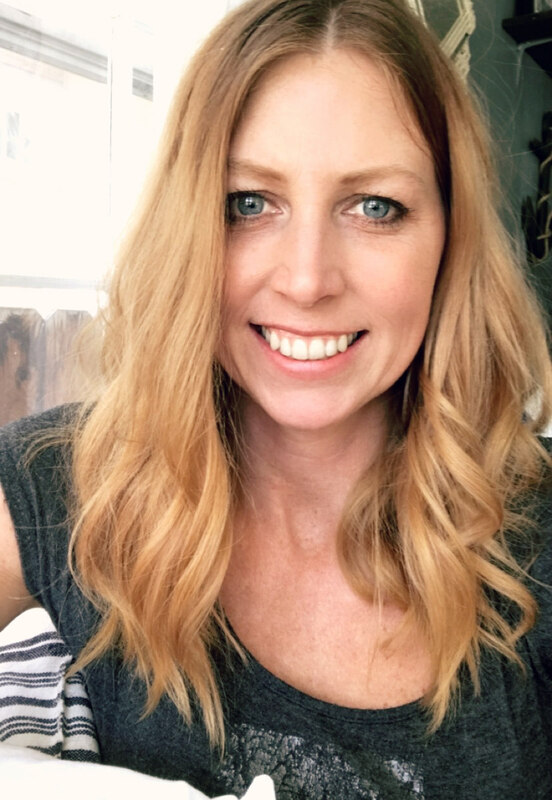 i always love your home- the office is my favorite space i think but i love it all! 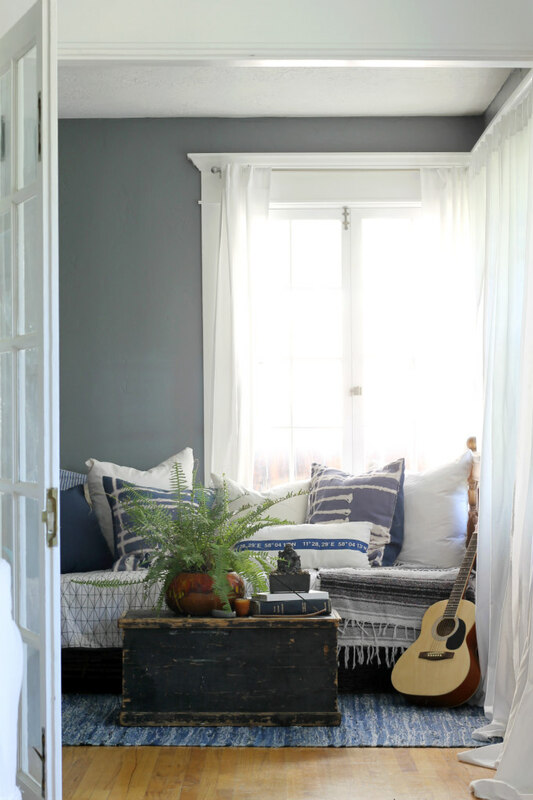 Have you had the denim rug a long time--has it gotten a lot of wear? Have you used a vacuum on it? 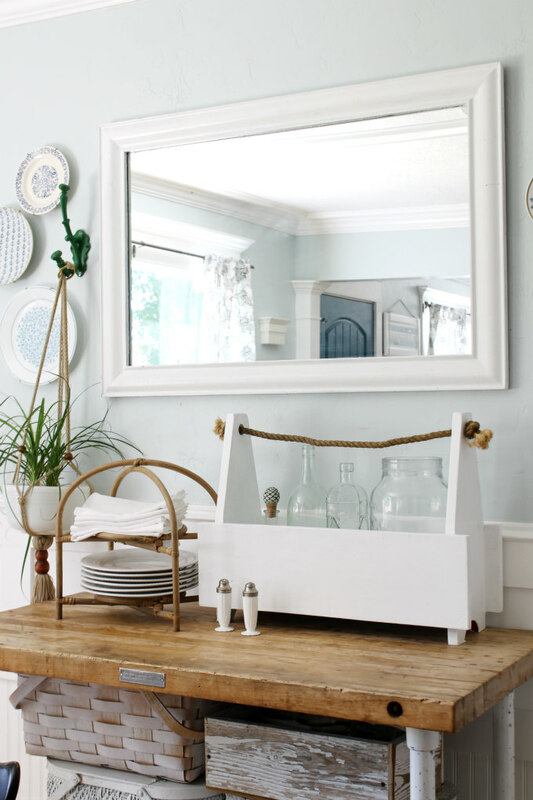 I've been looking at one and been hesitant because it would be in a high traffic area in my home. I know how denim ravels and didn't know how well it would stand up to constant use and vacuuming. How has yours done? What is the color of your front door? Hi there! Lovely home. 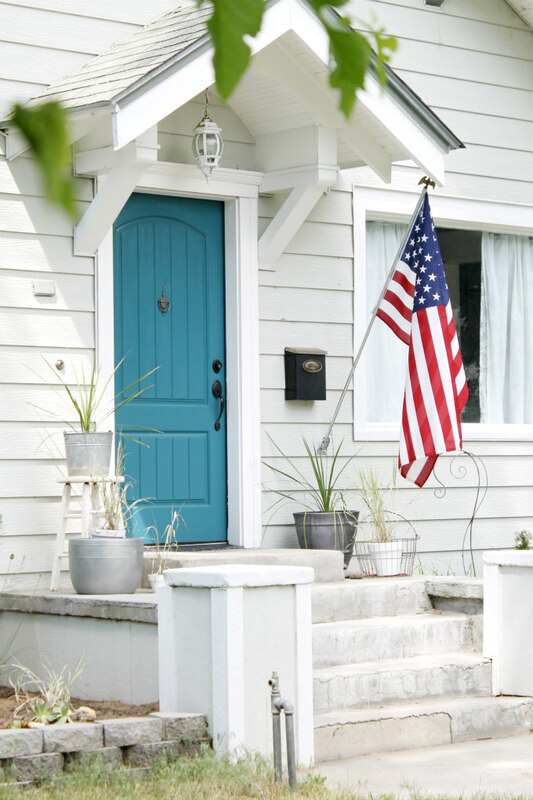 Would you mind sharing the color of your front door? It's so refreshing & fun!